I'm often asked how we run our telecom program at Delmar Elementary School so I've decided to try to explain on these pages. I was assigned to Delmar nearly seven years ago and had already started using telecommunications with my 6th graders in a previous school. This is our story...read on to see the new and exciting developments!! I was assigned to teach in a 6 station Title 1 Jostens lab at Delmar Elementary School in the summer of 1991. My students are in grades 1-3. In my former school we had a modem and a phone line in the Jostens lab but I didn't have one at my new assignment. I knew we had to change that! We ran a phone cord down the hall and across the media center from a guidance office to a stand-alone 286 in my lab. Eventually that cord was put in the ceiling. Before long a local businessman donated the installation of a third phone line into our school. There is a switch box by my computer because we had to share this third line with the school office for the first five years of our telecom activities. We now have our own phone line in the lab but for 5 years this was how we got on-line - dailup from one computer using a shared phone line. We began using telecom within the state of Maryland as a means to meet other people and to sharpen writing skills. In the spring of 1992 we launched out into the Internet and the world was ours! 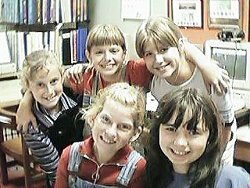 Once we were on the Internet we began to meet students and teachers from all over the world and especially within the KIDLINK organization. One of our early projects was called "The Infant Project" and involved communication with six and seven year olds in London, Iceland, Tasmania, Peru and Hawaii. As our projects developed and maps appeared on my lab walls the older 5th and 6th graders soon showed interest in what we were doing. They saw the flags on the maps pinpointing our 'keypals' and the pictures and goodies we were receiving via 'snail mail' from our global friends. Little by little these older students started appearing in my lab during their recess time (my planning time) because they wanted to join the fun. Our telecom program at Delmar has grown because the kids want it. Bottom line. This is what has driven me to keep doing what I love to do best with them - bring them into the global classroom. The 5th and 6th graders are not my assigned students so they come to me during their recess time. They can also come two days a week after school from 3:00-3:45 PM. I have been able to arrange my schedule so that I can work with these students when they have recess. My own Title 1 students are eating lunch, playing on the playground or having Math at that time and I cannot take them for computer class. This is a good arrangement for all of us. In the beginning we only had 6 student stations with a wordprocessor for the students to use. This very quickly became a problem. I had more than 6 students who wanted to do telecom. I began to ask anyone I could for donated computers. We would accept anything that people wanted to give us. Little by little XT's with no hard drives began to appear on our door steps. My Jostens lab is located in a corner of the media center. I placed these donated XT's on a table in an area of the media center just outside my tiny Jostens lab. This way the kids would be within reach as they typed. I never stopped asking for donations and in Novemberof 1995 we received our fastest and most up-to-date PC - a 486. With the donation of this computer the kids were finally able to see the school WWW pages which I had made and began to learn a little about making their own homepages. Donations of used computers still come our way. We started with XT's but it wasn't long before several 286's, 386's, four 486's and one Macintosh computer that we lovingly call, "Baby Mac," were soon in our "KIDLINK" lab in the media center. I also put about 25 older computers in individual classrooms. The kids have learned how to boot the XT's from a DOS diskette. Not all of the classrooms have a printer so diskettes are brought to my lab for printing files. The XT's in the classroom do not all have color monitors so this limits the types of programs we can use. Some of the disk drives are 5.25" which is also a factor. In truth, all we really need is a simple wordprocessing program for creating e-mail and for writing text files in the classroom. It never ceases to amaze me that these students are excited about creating simple text files! If you take some time to look through our Web pages you'll see that we have been involved and are still doing *many* projects. I don't advise anyone to try to tackle this much! You can't keep up with me - I'm wired now you know. The time investment is quite large. Our school was twinned with The Cedars Primary School in London and six of our teachers and their classes corresponded with kids in the United Kingdom for two years. This project won us national recognition. Our involvement in the "Balloonin'USA" project two years ago was started by Myrna Hastings, a third grade teacher. One of our wonderful sixth grade teachers is always ready to give her students writing assignments around our KIDPROJ projects. Little by little the telecom 'fever' is spreading and this is wonderful. Since I am the Manager for KIDLINK's KIDPROJ list most of our global projects are KIDLINK projects. Teachers will often have students start their project work and writings in the classroom or for homework. Then, during the course of the day students will arrive at my lab of donated computers and start typing their files while I am busy in my "real job" with the Title 1 students in our Jostens lab just around the corner. The older students in grades 5 and 6 know how to send their own files as e-mail. The students spend their half hour recess time creating the text files for e-mail and save them to a diskette if they don't finish in time. Those who finish send their own files. Three years ago a local Internet provider, ICNet, gave all of our area schools a *free* PPP account for use during the school day. This has been an incredible blessing for all of us. We have our own school account: des@shore.intercom.net and the students send their mail through this account. We don't have individual student accounts. Donna and Phil love us! 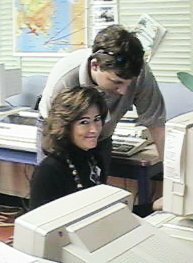 The week of March 10, 1997 two of our best friends arrived at Delmar with cables and network cards for four of our 486's in the Delmar "KIDLINK" lab. We are now wired to the Central Office WAN and our local Internet Service Provider, ICNet, with a 56K line. Four computers are now on-line at once! This is exciting!! We love you, Donna and Phil! The students are running to the lab during their recess time and after school to get the four coveted seats. They feel empowered now by the new skills they are learning. I have made the students responsible for sending their own e-mail. They have learned how to "cut and paste" text that is typed off-lineto include it in an e-mail message. They save their text file in ASCII and import it into Windows Notepad. Once the file is in Notepad they cut and paste it into Netscape's e-mail composition window. I'm so proud of them. Our little corner of the Media Center now has twelve donated computers and four areconnected to the network. We are "cookin' on the front burners!" Our students are making web pages on eight of these computers. Yes, that's correct - eight. Four of our computers that are not connected to the network have Windows on them and enough disk space to run Netscape. We "trick" Netscape and load it without a network connection. Once Netscape is running the students work on their web pages and view them locally. You don't really need to be online to make webpages as long as you have a browser open. The students are having a great time with their HTML creations. ...another chapter to our story. 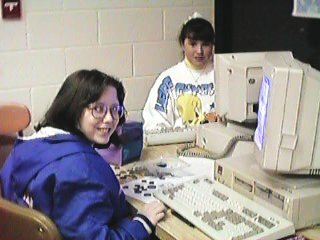 April 1999 - Delmar student, Kate Lilley, won a Campbell's Soup Art contest and won 26 new Gateway computers for our school!